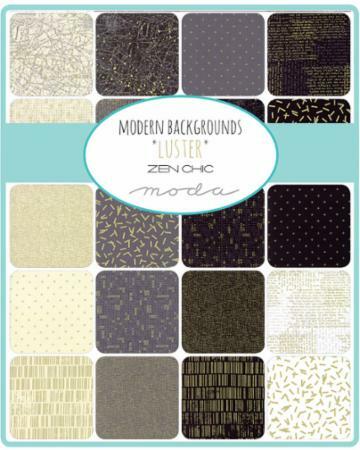 That sound you heard may have been my gasp aloud swoon when I laid my eyes upon the new addition by Zen Chic for Moda Fabrics! Modern Backgrounds has been my background fabric of choice for all of my blocks for The Splendid Sampler and it has made its way into various other projects for the past nine months. I have been keeping track of my pieces to make sure I have enough to complete the 100 block quilt ( mine may be a few short but it will be fabulous!). When I started looking through the fabrics, the theme song from the James Bond movie Goldfinger was playing in my head. I may have been singing it also ;O) But just look at all of the stunning prints embellished with gold! Pure luxury and elegance! The metallic gold is so gorgeous in this collection filled with text, designs and maps! The range variety is spectacular! I chose six Aurifil thread colors for this collection. From left to right: #2692 in 12 wt cotton ( red spool), #5004 in 50 wt ( orange spool), #2620, #2610, #4060 ( a fabulous variegated) and #2026. These would all work perfectly with the Modern Background Luster! This collection is available now at your favorite local or online quilt shop! Linking this Sunday Stash up to Molli Sparkles! That background paper is lovely! Can't wait to see it in person! And you can't go wrong with your Aurifil choices! So beautiful stash.Can´t wait to see your new projects with it.! I can't wait to see what you make! The fabrics look so beautiful and the threads are so vibrant! I should be getting my Luster FQ bundle in the mail soon, can't wait!